This harness is easier to put on your dog than any others we've seen. 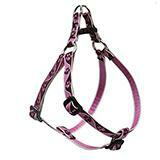 A popular style of non-restrictive harness with two adjustment points and a double-D-ring to attach the lead to. To Fit: Measure snugly around the ribcage, just behind the front legs, with the dog standing. Add an extra 5% to determine girth size needed. To Use: Unbuckle the harness. Place one front paw in each opening. The sternum strap goes between them. Bring the two buckle ends up over the dogs back and clip together. Attach leash (not included) to both D-rings. Material is 1/2 inch wide and adjusts from 10 inches to 13 inches.